1. Static NAT – translates one private IP address to a public one. The public IP address is always the same. 2. Dynamic NAT – private IP addresses are mapped to the pool of public IP addresses. 3. Port Address Translation (PAT) – one public IP address is used for all internal devices, but a different port is assigned to each private IP address. Also known as NAT Overload. Computer A request a web page from an Internet server. 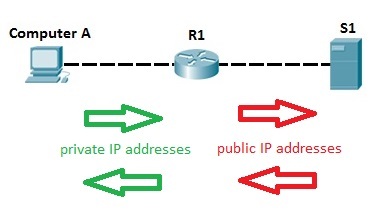 Because Computer A uses private IP addressing, the source address of the request has to be changed by the router because private IP addresses are not routable on the Internet. Router R1 receives the request, changes the source IP address to its public IP address and sends the packet to server S1. Server S1 receives the packet and replies to router R1. Router R1 receives the packet, changes the destination IP addresses to the private IP address of Computer A and sends the packet to Computer A.